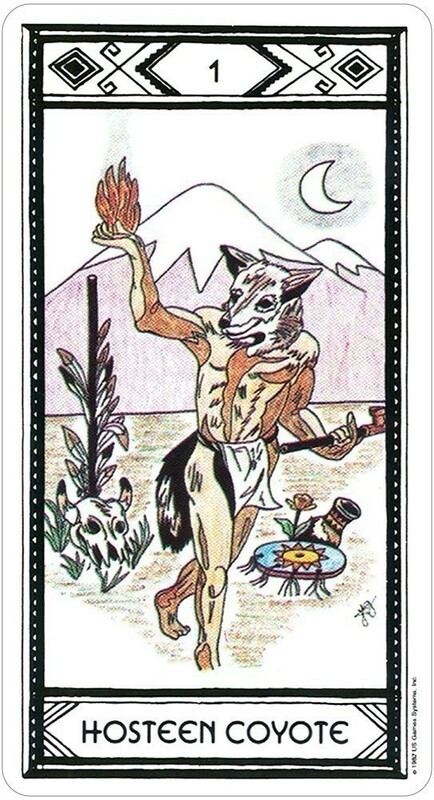 The Native American Tarot is drawn from the four corners of North America: Eastern Nations, Plains Nations, Southwest Nations and Northwest Nations. The cards are informed by a variety of Native American tribes including Apache, Arapaho, Cherokee, Cheyenne, Chippewa, Comanche, Hopi, Huron, Inuit, Iroquois, Kiowa, Navaho, Papago, Pima, Pueblo, Shawnee, Sioux, and Yaqui. 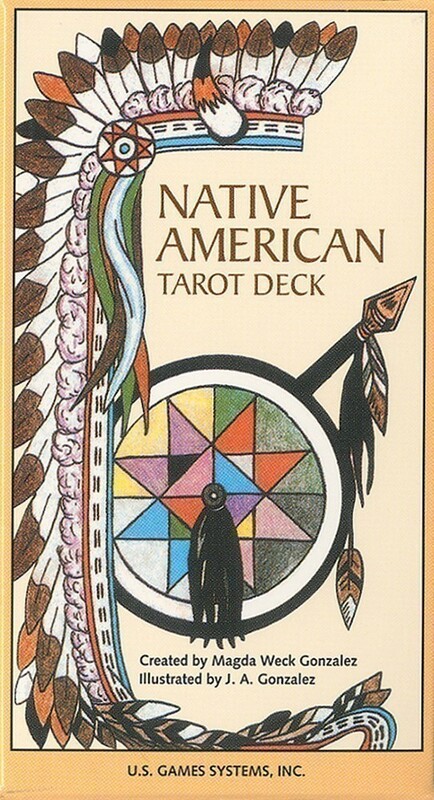 This deck is not limited to the standard interpretations of traditional illustrations, but reflects the spirit and meaning of the Native American Way. The 108-page booklet includes instructions for the Medicine Wheel spread, the Native Cross spread, the Shining Star Spread, and others. Cards measure 2.375" x 4.375"
The cards feature soft colors on a predominately white background with black borders. 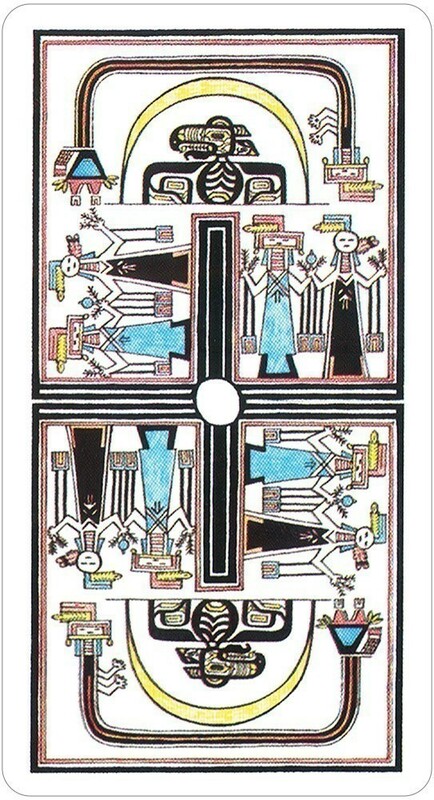 Hand drawn, colored pencil images make up this unique, slightly masculine, southwest deck. The card titles are in English. Suit titles are only on the Tribal Figures (Court Cards) and Ones (Aces). The pips have a individual card titles; for example, rather than the 7 of Pipes it is labeled Counting Cup, 10 of Shields = Harvest, 8 of Blades = Captive, etc. 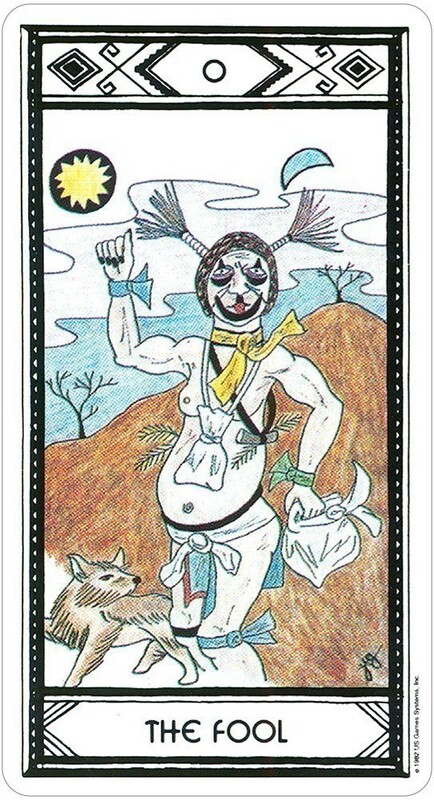 The LWB does a good job at explaining different folklore and stories associated with the individual cards depicted. It does not have much in the way of divinatory meanings. The Major Arcanas have no reversed meaning. Leaving it to the reader to use the lessons from the stories and the individual card titles for the divinatory meanings. It might not be suitable for a beginner. It is one of the longer booklets I’ve come across. The LWB also includes some Native American history and 5 spreads. This is not a deck that would normally attract my attention. I usually go for bold color and computerized artwork. But I showed up at a family gathering without my cards and I was handed this deck by my Mother-in-law, to "pretty please do a reading." So I gave it my best shot and I was surprised at how easy these cards are to read. The artwork is simple, but it has enough detail to really get a lot of intuitive information for a good quality reading. The Stars card is my favorite "Star card", out of all the decks I own. It depicts a large spider in the center of a web with small stars scattered throughout the web, reminding me of the dew in the early morning when all seems new and anything is possible. After this experience I decided that this was a must-have addition to my collection. Anyone that has an interest in Native American decks should take a look at these cards. 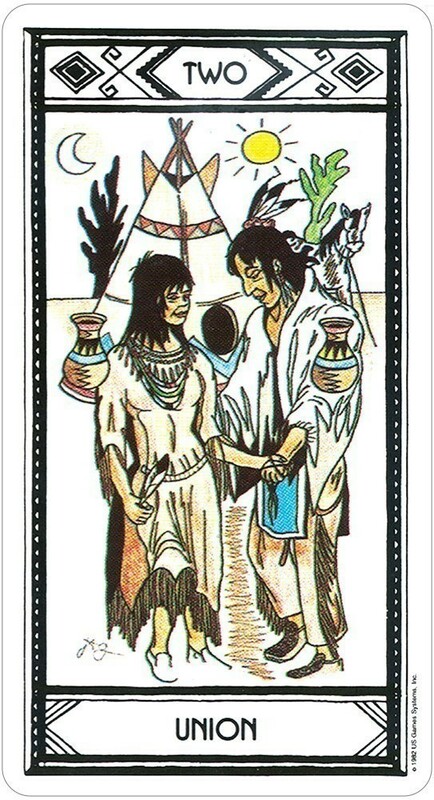 I like these tarot cards because I feel they can help give guidance through Native American symbolism and wisdom. You will have to deeply read the book about the meaning of each card and consider it before deciding what it means to you. I think that the fact it requires thought and meditation to actually see meaning is a good thing, as opposed to a cookie cutter or fortune cookie approach. 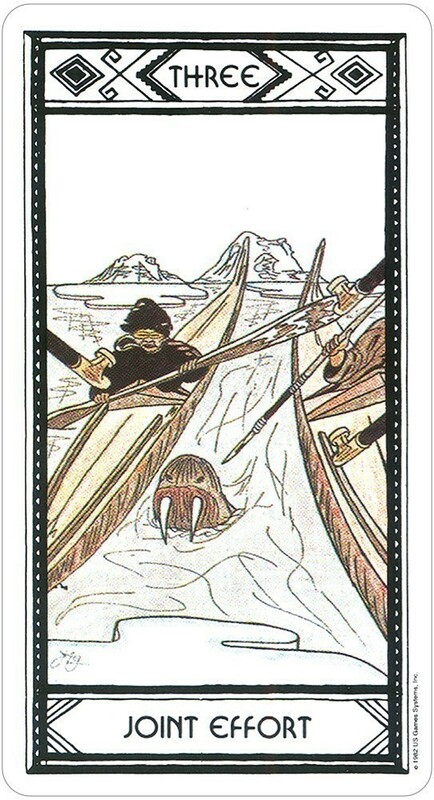 I also like that these tarot cards don't have an occult association with them. They are more based on Mother Earth, tribal and natural symbols and associations. I have enjoyed using them and I think they help me give insight into some situations. Power Path to Love. This is the first deck with which I learned to do readings -- and it is still my deck of choice. 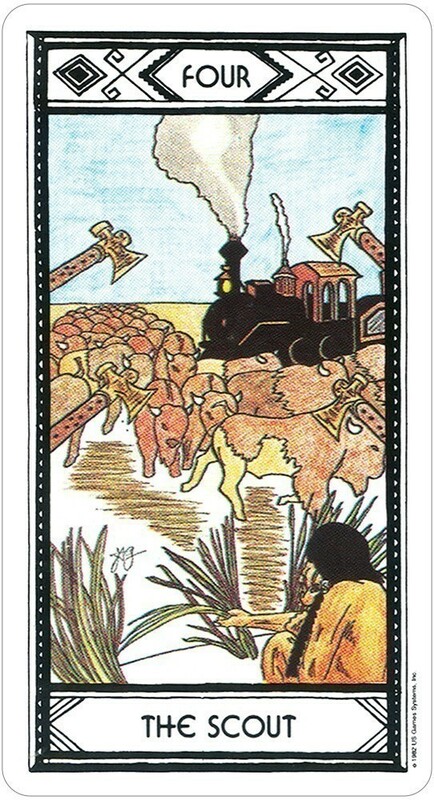 The meanings and illustrations provide more room for intuition and personal interpretation than traditional decks. It also gives Native American views, teachings, and history. 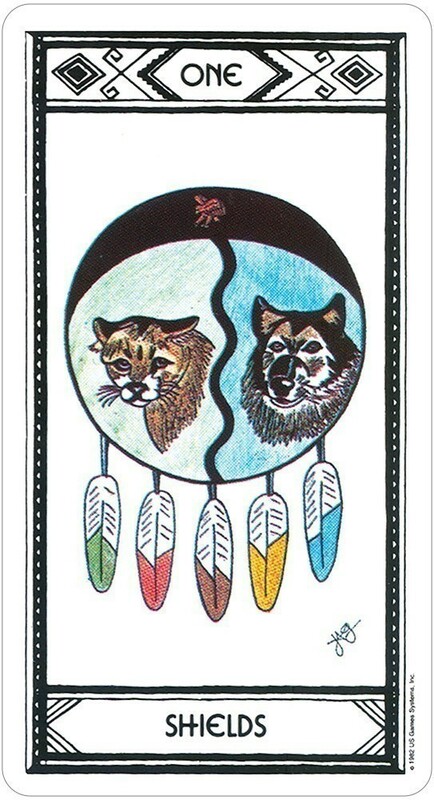 If you feel drawn to the Native American way of life (Shamanism, animal teachings, etc) or are looking for other interpretations for traditional tarot cards, this is the deck for you.